A sinner who repents shall be saved. 22 All his transgressions that he hath committed, they shall not be mentioned unto him: in his righteousness that he hath done he shall live. . . .
Randal S. Chase spent his childhood years in Nephi, Utah, where his father was a dry land wheat farmer and a businessman. In 1959 their family moved to Salt Lake City and settled in the Holladay area. He served a full-time mission in the Central British (England Central) Mission from 1968 to 1970. He returned home and married Deborah Johnsen in 1971. They are the parents of six children—two daughters and four sons—and an ever-expanding number of grandchildren. He was called to serve as a bishop at the age of 27 in the Sandy Crescent South Stake area of the Salt Lake Valley. He served six years in that capacity, and has since served as a high councilor, a stake executive secretary and clerk, and in many other stake and ward callings. Regardless of whatever other callings he has received over the years, one was nearly constant: He has taught Gospel Doctrine classes in every ward he has ever lived in as an adult—a total of 35 years. Dr. Chase was a well-known media personality on Salt Lake City radio stations in the 1970s. He left on-air broadcasting in 1978 to develop and market a computer-based management, sales, and music programming system to radio and television stations in the United States, Canada, South America, and Australia. After the business was sold in 1984, he supported his family as a media and business consultant in the Salt Lake City area. Having a great desire to teach young people of college age, he determined in the late 1980s to pursue his doctorate, and received his Ph.D. in Communication from the University of Utah in 1997. He has taught communication courses at that institution as well as at Salt Lake Community College and Dixie State University for 21 years. He served as Communication Department chair and is currently a full-time professor at Dixie State University in St. George, Utah. Concurrently with his academic career, Brother Chase has served as a volunteer LDS Institute and Adult Education instructor in the CES system since 1994, both in Salt Lake City and St. George, where he currently teaches a weekly Adult Education class for three stakes in the Washington area. He has also conducted multiple Church History tours and seminars. During these years of gospel teaching, he has developed an extensive library of lesson plans and handouts which are the predecessors to these study guides. 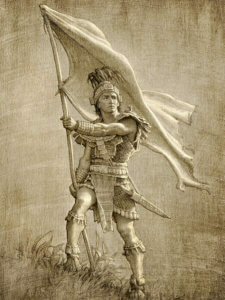 Dr. Chase previously published a thirteen-volume series of study guides on the Book of Mormon, Church History, the Old Testament, and the New Testament. 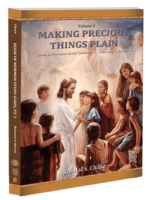 The series, titled Making Precious Things Plain, along with four smaller study guides on Isaiah, Jeremiah, the story of the Nativity, and the final week of our Lord’s atoning sacrifice, are designed to assist teachers and students of the gospel, as well as those who simply want to study on their own. Several of these books are also available in the Spanish language. Most of the beautiful artwork shown on these pages is used by permission from Joseph F. Brickey. We thankfully acknowledge his generosity not only on these pages but also throughout our books. We invite you to visit The Fine Art of Joseph F. Brickey on the web to see a full gallery of his beautiful paintings. We also thankfully acknowledge several other artists who allowed us to use a few of their works on these pages and in our books: Del Parson, Walter Rane, David Lindsley, and Scot Facer Proctor.